The growth of innovation in Bogota has primarily surged as a result of the Colombian government’s efforts to revitalize the country and the capital through the innovation economy. For example, in 2012, the National Government founded INNPulsa to promote business development in Colombia, with the goal of putting Colombia in the top three most innovative economies of Latin America. In partnership with INNPulsa, the startup accelerator HubBog has already invested in many innovative startups in Bogota since its inception. Also headquartered in Bogota is the Ministry of Technology and Communications’ brainchild Apps.co, an online learning platform that helps turn digital business ideas into fully-developed enterprises. With all this support from the Colombian government, it is unsurprising that many of Colombia’s most innovative startups were founded in the capital. The now-international delivery service, Rappi, who raised a US$9M Series A round led by Andreessen Horowitz, got its start in Bogota, as did the Colombian answer to Classpass, Fitpal and invoicing technology company, Portal Finance. These companies have already flown beyond Colombia’s borders into Mexico and are set to reach the rest of Latin America, as well. Two-factor authentication technology, Authy, also comes from Bogota and was acquired by cloud communications platform Twilio, representing one of the more interesting exits in Latin America. Nonetheless, even the booming capital of Colombia suffers from the perceptions of violence and corruption that still plague the nation; as a result, in the past startups found it challenging to receive funding. This, however, is changing now that big US funds have begun to invest in the regions Bogota hosts most of Colombia’s largest investors so startups looking to work with international venture capital firms with a Latin American focus, such as Firstrock Capital, Wayra Colombia, or Polymath Ventures and Magma Partners would find Bogota to be a strategic location to found a company. As the most innovative and cosmopolitan city in Colombia, Bogota does not lack for places to work, with many coworking spaces, including Carpe Diem House, Colabora, El Cluster Coworking Hub, House Lab, and AtomHouse (in Bogota and Medellin) enabling entrepreneurs to work from any part of the city. Some entrepreneurs find Bogota a challenging city to live in, due to urban sprawl, high amounts of traffic, and unpredictable weather. Those who do choose to call Bogota home, however, have an easy time traveling, as Bogota is roughly five hours from everywhere in the US. Bogota is a mere three hour direct plane ride to Miami, five hours to Chile, and seven hours to LA. Entrepreneurs living in Bogota can enjoy direct flights to major hubs, which eases the burden of travel. Bogota is still unquestionably the economic and political capital of Colombia, outstretching its smaller counterparts. While Medellin, Cali, and Barranquilla are quickly emerging startup hubs in Colombia, Bogota is still the place to be for business. The second biggest city in Colombia is already competing fiercely with the capital to become the innovation center of the country. With government initiatives like incubator Ruta N and university startup accelerator Parque del Emprendimiento, Medellin is becoming well-known as a hub for international entrepreneurs. Located about 3000 feet lower than Bogota (8300 ft.), Medellin (4980 ft.) has perfect sunny weather year-round and boasts a significantly lower cost of living, making this city the ideal place to bootstrap a new startup. Growing tech companies like Viajala – a platform for comparing airfare in Latin America – and SiembraViva – an organic produce delivery service that supports small farmers – have found a niche for themselves in Medellin. Even delivery giant Rappi has a center of operations in downtown Medellin, as this city has boomed in the past ten years. Medellin’s miraculous turnaround has put it on the map as an emerging hub for entrepreneurship, bringing in investors looking for explosive growth. Venture capital firms like Firstrock Capital (with offices in Medellin and Bogota) and Capitalia are already capitalizing on the innovation coming out of Medellin, and these investments will undoubtedly grow in the coming years. Nonetheless, much like in Bogota, Medellin’s reputation, which is very much unfounded, sometimes holds the city back from receiving substantial investments that would allow the startup ecosystem in Colombia to compete with innovation heavyweights like Argentina, Brazil, and Chile. Still, as digital nomads and entrepreneurs have flocked to Medellin, the city has become replete with high-quality coworking spaces to suit any startup. Some of the best include La Casa Redonda, NODO Coworking, Quokka Cafe Coworking, and AtomHouse Medellin (also found in Bogota). Medellin, known as “the city of eternal spring,” draws in many entrepreneurs simply for the enjoyable weather. 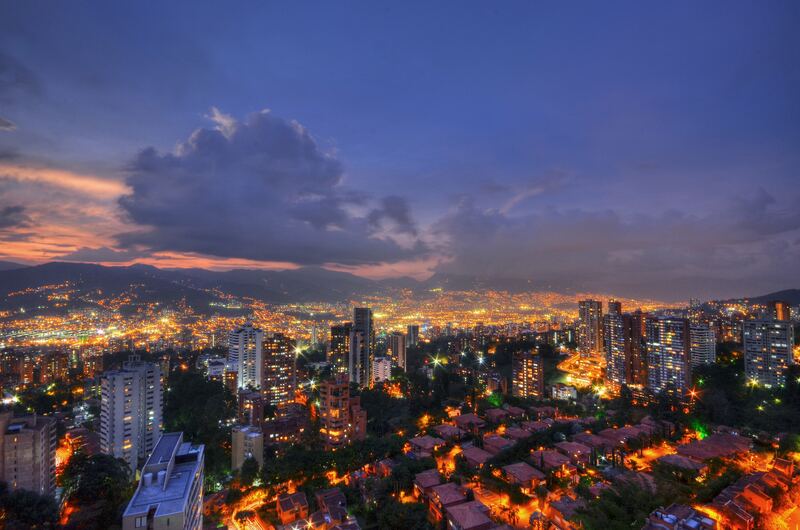 Medellin also has a lower cost of living than Bogota, where rent is 20-30% higher. More airlines now offer flights directly in and out of Medellin, eliminating the once necessary stop in Bogota. People in Medellin enjoy direct, flights to Miami, New York City, and other major hubs across the United States. As the Municipality of Antioquia tries to transition Medellin to the innovation economy, this city has become one of Colombia’s largest centers of entrepreneurship. Second only to Bogota in terms of innovation, Medellin boasts newer infrastructure, a lower cost of living than the capital, and is quickly coming to the attention of international entrepreneurs as an ideal place to launch a new venture. Cali is the capital of the Valle de Cauca region and the economic center of Southwestern Colombia. It is also the only major Colombian city located near the Pacific Coast. Last year, Colombia’s third-largest city hosted a successful Startup Weekend that demonstrated a growing entrepreneurial community in Southern Colombia. This nascent community has gained the support of a few small investors, namely Creatic, a tech incubator and education center for the Valle de Cauca region. They have partnered with coding boot camp Coderise to train 800+ people in digital skills and to train 26 teachers to teach students programming. The tech education support from Creatic is empowering entrepreneurs from Cali to create innovative online platforms that help the people of Cali solve pressing pain points. Another Cali-based initiative is ParqueSoft, a social entrepreneurship initiative. ParqueSoft acts as an incubator for marginalized individuals in Colombia and is led by innovators in digital art, science, and IT. This organization allows new entrepreneurs to learn skills and gain experience needed to succeed. Cali is predicted to follow soon in the footsteps of Medellin and is quickly attracting real estate investment from speculators betting on Cali’s rise. However, Cali still lags behind Medellin and Bogota when it comes to quality of life and ease of doing business, even though the government of Cali has tried to advance investment in the Valle de Cauca region through Invest Pacific. The regional government is also redoing the infrastructure to turn Cali into a “smart city” to put it on par with Colombia’s larger innovation hubs. Coworking is catching on in Cali as well, with El Lab Coworking and Enfoque Lab providing varied options for entrepreneurs and digital nomads. With its strategic location just an hour from the Pacific Ocean and signs of initiative from the regional government to promote innovation, Cali could quickly become a key startup hub in the Andes. Traveling is an issue, as getting to the United States or another Latin American country takes time and is much more expensive than flying out of a hub like Bogota. And while the cost of living in Cali is much lower than in Bogota, the city is not as developed in terms of infrastructure. Colombia’s fourth most populous city and home to its largest port, Barranquilla is another burgeoning startup hub located on the Caribbean Coast. As one of the oldest cities in Colombia, Barranquilla has historical importance, as it was once the second largest city in the country. While Barranquilla’s startup scene is still in its beginning stages, the government of Barranquilla is actively working to improve the city’s poorly planned infrastructure to put Barranquilla back on the map as an innovative city. Barranquilla’s new accelerator, Macondolab, is starting to empower startups on Colombia’s Atlantic Coast with support from government initiative, Apps.co. Macondolab, founded at the Simon Bolivar University, has already supported the growth of 30+ startups with mentorship, office space in their downtown Barranquilla campus, and seed capital. At the moment, Macondolab is the only well-known startup accelerator in Barranquilla but its founders have big ambitions of making a name for themselves in Colombia and Latin America as a whole. Also headquartered in Barranquilla is CaribeTIC, an organization that brings together the IT sector of the whole Caribbean region to promote the competitiveness of tech companies coming from the area. Venture capital is still scarce in Barranquilla, although Corporacion Ventures (based in Bogota) has partnered with the Barranquilla Chamber of Commerce to make strategic investments in social entrepreneurship in this port city. The regional government of the Atlantico State has yet to make any significant tech investments, but they are trying to encourage investment in Barranquilla through ProBarranquilla, meant to make the city more attractive and open for business. The most notable startup to come out of Barranquilla is Koombea, a B2B digital product development company that was founded in 2007 and has since gone on to build apps across five continents. Other Barranquilla-based startups include Appetit, a social network for foodies, and Joonik, a full-stack software development startup. For those looking to work in Barranquilla, the coworking scene is already well-developed, which makes finding an office relatively easy. Standout options include the Cubicus Workspaces located all over the city, Monokuko Space, a creative, open office environment, and Construconceptos, a flexible, coworking and coliving space in the north of the city. Barranquilla, like Cali, has lower Internet connectivity and is difficult to travel in and out for entrepreneurs trying to go back and forth to the US. Numerous outsourcing companies set up shop in Barranquilla because of the high level of English spoken in the city and relatively sound infrastructure. Barranquilla, however, is much smaller than Bogota, Medellin, and Cali, so entrepreneurs do not have the same community of resources there. Overall, with startups already competing on the global market, Barranquilla is poised to become a leader in innovation in the Caribbean, especially considering Colombia’s emphasis on entrepreneurship. The four largest cities in Colombia are quickly growing to become major players in Latin American entrepreneurship. New contributions from Barranquilla and Cali have put these two cities on the map, and their strategic placement will enable them to catch up to better-established hubs like Medellin and Bogota. The Colombian government is pushing hard to promote innovation all over Colombia, and the results are beginning to show, with startups like Rappi, Authy, and others showing Colombian entrepreneurs the way forward.